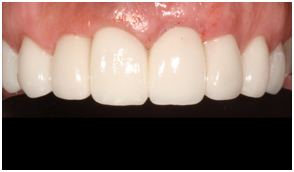 Combination of Implants, Crowns in the upper and Ceramic Veneers in the Lower. A socialite lady aged 53 years old presented at Dr. Turners Dental & Implant Centers about 6 months ago. 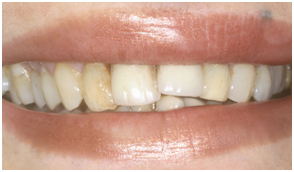 On clinical examination, she had severe bone loss in the Upper front Central Incisors with a very high plaque index. The upper front central incisors after clinical and radiographic examination showed a poor prognosis. The Lower 6 teeth also were very irregular and badly stained. 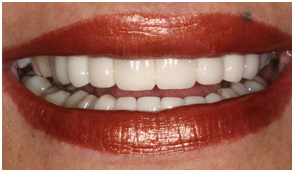 The patient required an entire smile makeover with Dental Implants, All Ceramic Crowns and Veneers. 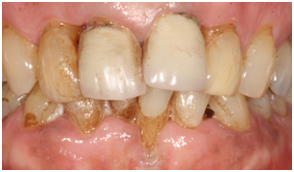 The upper two central incisors were hopeless and therefore extracted. Two Ankylos C/X Implants were placed in their place. The lateral incisors and canines were crowned with LAVA 3M Zirconia Crowns (USA). The other teeth were veneered to complement the smile and compete it. 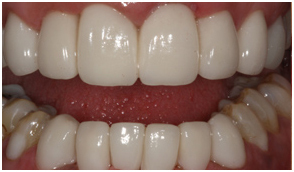 For the lower anterior teeth veneers were planned with CAD -CAM IVOCLAR VIVADENT Emax veneers. Esthetics was the patient's highest concern and so the treatment plan at every stage was done with that in mind. The patient, a Page 3 socialite was ecstatic with the results….and so was the entire team at World-Dent that helped her achieve this smile she always dreamt of!! after restoration of the Implants & Crowns. showing the 2 failing Central Incisors. A Total full mouth Restoration with Implants, Crowns in the upper, ceramic veneers in the lower, complemented her new smile.